Belgian Mums© are the finest breed garden mum on the market today with over 30 years of breeding and testing. They grow well in any container size from a market pack to a half bushel. 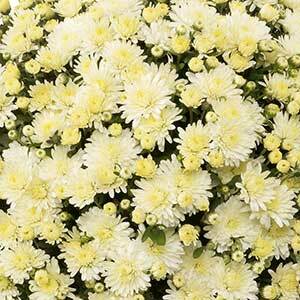 Belgian Mums© have a mounding habit, produces a multitude of blooms, branch better and more often than other mums. Propagation prohibited. We recommend that the diameter of your finished plant be 1.5 to 2 times the pot size. On average, starting with a rooted cutting, a Belgian Mum will grow 1.5" per week. Knowing this, if you want your 6" Belgian Mum to finish with a 12" spread you would need to plant rooted cuttings 8 weeks prior to your desired finish date. You will need to pick your arrival date based on the bloom time of your variety and finished pot size. Belgian Mums© grow well in a well-drained, loose, soilless media. Do not use any type of water retaining gel. This will create root disease. You may consider incorporating slow release fertilizer to ensure a steady supply of nutrients if your crops are grown outside with overhead irrigation. Try to maintain a soil pH of 5.8-6.2. Weekly soil tests are recommended for maintenance. Grow mums in full sun for best quality. Belgian Mums© require a considerable amount of well-balanced fertilizer. During the vegetative stage of development, we recommend using 20-10-20 or similar type of fertilizer at 250-300ppm with each watering. During the generative growth, or flower development period, switch to potassium-rich fertilizers: 15-5-30 or KNO3 at 300ppm until flowers are showing color. Once you see color use, clear water. Applying magnesium sulfate as a spray before first color will make plants stronger, enhance color and extend shelf. Garden Mums grown in full sun will have the best quality. If unable to maintain proper temperature and lighting, apply Florel week before or after transplanting at 500ppm no later than June 20th to avoid flower delays. All Belgian Mums© can be treated as no pinch varieties if grown in a 6" or larger container. For smaller pots, pinching is fine and can be done when planting the rooted cutting. Always do a "soft pinch" removing only ½" or less from the cutting tip. Pinching hard or pinching after July 15 may delay flowering. Spacing will vary from grower to grower depending on finished pot size and your target sales market. For best results, the foliage should never touch. To calculate spacing, a good rule of thumb is to use the expected diameter of the plant plus 2". No growth regulators are needed. Smaller finished products may benefit from the use of growth regulators. B-9 sprayed at 2500 to 5000 ppm will slow the growth. A Bonzi drench at 2-3 ppm will almost completely stop all growth. The last PGR application should be no later than 4 weeks before first color. Excessive or late applications of growth regulators will delay flowering. Florel will not increase branching but is recommended as a foliar spray during rooting and shortly after transplanting outside to prevent premature budding. This treatment is not necessary for indoor finished crops. Florel may not abort existing buds but will prevent formation of new flower buds. The most common pests drawn to this crop are Aphids, Mites, Caterpillars, Leafminers, and Thrips. Gediflora offers disease free, greenhouse grown cuttings that should perform better than any other mums on the market. Thorough monitoring of your crop, implementing IPM program and prevention are the best defense options against insect and disease problems. Since there is no good chemical control for Bacterial leaf spot and Fusarium, it is very important to use drip irrigation, sterilize production areas, remove weeds and use healthy plant material. Plant deep so the top of our ellepot is slightly below the soil level in your container. It is especially hard to plant deep in a growing media with a high content of pine bark. Slow down the transplant line, and do it right. Plant in the center. This will eliminate any issue of lopsided, wobbly plants at finish. There is a chance you had 10-15% plugs planted off-center last season. Do not pinch. Belgian Mums© have the ability to self-pinch. None of the pinch techniques are perfect, and you will never achieve good uniformity from pinched plugs.